The total capacity of the hotel is 35 double rooms threebedded rooms, and 3 apartemens. 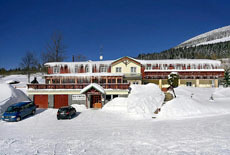 From the wintersaison 2004 you can also offer new rooms De Luxe with balcony. All the rooms are equiped with the own WC, shower, Safe and TV-sat. On your demand is also possible the safe. The domestic animal is possible for the charge 300,- CZK. The hotel restaurant is open daily from 11 a.m. till 11 p.m. You can taste here the specialities of the czech and international cuisine. The breakfast is served from 8 a.m. till 10 a.m. It is possible to order the half-board. 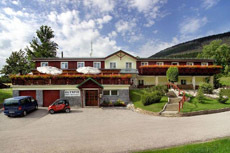 To the guests is also disposal the daily bar and the terrace with a beautiful sight on the tops of the neighbouring mountains. The parking place is directly by the hotel.